Let me just start by saying that I don't know anything about anything. I’ve read some stuff, and I've tried some stuff. 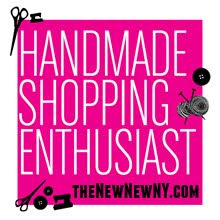 I’m still new at selling my work, especially, in-person, so what I have to share about craft show displays is not expert advice, but rather just a bit of my own stumbling learning experience. I hope it's instructive, or at least entertaining. 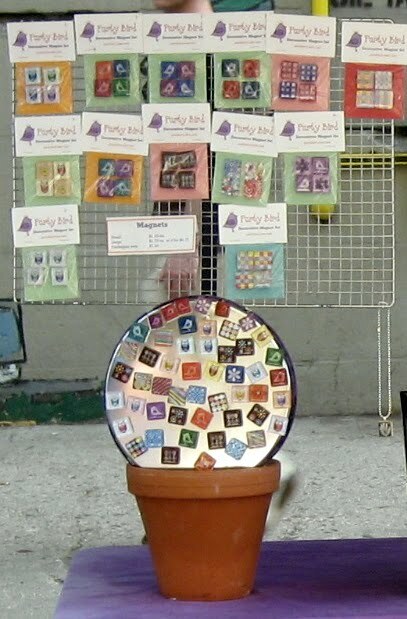 I make paper-mache bird figurines and ornaments, Scrabble tile pendants, and glass tile magnets. The two biggest challenges I face in displaying my work are cost and transportability. I keep costs down and my displays transportable by foot and/or subway by making them myself. Luckily, my wares are small, and my aesthetic is D.I.Y./upcycled/shabby chic, so I have some flexibility in this regard. I also worked in a hardware store for a couple of years right out of college so I’m familiar with the range of items available there that can adapted for display or display-making purposes. My favorites are wood dowels, flowerpots, and Plaster of Paris (I actually HATE Plaster of Paris, but it’s useful so I cope). Going the D.I.Y. route has its risks, the main one, of course, being the display not working. I experienced this recently with my magnet display. 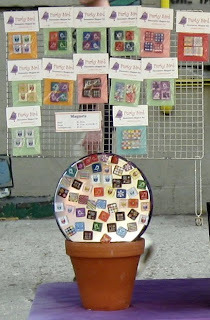 My magnet display is essentially a “tree” consisting of a flowerpot base, wood-dowel trunk, and a wire cooling-rack “canopy” of sorts that hold my packaged magnet sets. I’ve gone through three versions am about to christen a fourth. A key problem has been the size and weight of the base. This was perhaps most apparent in Version 1, which used a galvanized metal bucket instead of a flowerpot. The idea was for the bucket to double as a flat surface for displaying my loose magnets. It worked OK (not great) for that, but the bucket was so darned big that I had to use a lot of Plaster of Paris to set the dowel in it. I did foresee this problem, however, and tried to mitigate it by pouring the plaster and setting the dowel in a milk carton inside the bucket and then packing the rest of the bucket with foil and paper to keep the dowel centered. Nice plan, but it didn’t work. I still needed some plaster on the bottom of the bucket to weigh it down, and also to give the dowel some lift. The problem was that the diameter of the bucket so large that a ton of plaster to cover the bottom. The result was a ridiculously heavy and awkward of display element that didn’t fit into my storage/transport bin and that I consequently got totally dinged-up schlepping to and from a show in Brooklyn (on the subway). So for the next show I nixed the bucket and switched to a flowerpot. This was much more transportable and nicer-looking, but not without its own challenges, the main one being its shape: narrower at the base than at the top. Where I went wrong here was in being overly concerned about its weight (the memory of the galvanized bucket still fresh in my memory) and consequent transportability, in contrast to its stability. So, I did like I had done with the bucket and poured a layer of Plaster of Paris on the bottom as a base. But instead of setting the dowel inside a smaller container within the flowerpot, mixed the next layer of plaster with packing peanuts. This was supposed to provide structure without adding excess weight. I topped it off with a third layer of pure plaster to fill in the gaps and further stabilize the dowel. Another good idea, but it didn’t play. I wanted to be able to remove the dowel for transport so I wrapped it in wax paper before setting it into the plaster. This made the dowel removable, but at the cost of a snug enough fit. The dowel was so wobbly that I had to add plaster to the top layer to stabilize it. The result was a tree base that was heavier in the middle than on the bottom. Thankfully, it and the tree made it through the show that weekend but I scrapped it in favor of an entirely new set-up for the next. Alas, the shape of the flowerpot defied all effort at sufficiently redistributing the weight of the plaster. Magnet Tree No. 3 was heavier at the base than No. 2, but it still toppled over and onto to the pavement in a very unfortunately directed gust of wind its first time out, shattering the pot and crushing a bunch of magnets under it. Wah! Thankfully, my fellow vendors rushed in to help pick up the pieces (literally) and disguise the mess of the remaining tree base from the public with a large swatch of fabric. So I was back to Square 2, if I didn’t want to spend any more money or mix any more darned plaster, which I didn’t. Contemplating the riddle of my magnet tree, it suddenly occurred to me how I could address the weighting issue: FLIP THE POT OVER. I checked the diameter of the drainage opening on the bottom of the flowerpot and it fit the dowel perfectly. So I got out my drill and began eating away at the plaster that was currently blocking it. I drilled and drilled and drilled, and then chopped out the remaining mass of plaster with a screwdriver. I did this from both ends. I finished resizing the new opening with sandpaper. I stuck the dowel in and filled the few little gaps there between it and the pot with a couple of nails, and ta-da! A new, very much improved, sturdier magnet tree trunk! nice work linda....i admire your tenacity! It was good, Thank you for sharing.